As you splendid readers might recall, the other day we noted this New York Times piece by Boston Globe art critic Sebastian Smee. And we wondered whether Smee – whose Twitter profile describes him as “Pulitzer Prize-winning art critic for the Boston Globe, on leave in Australia for all of 2017” – was just having a summer fling with the Good Grey Lady or was perhaps setting up housekeeping with her. We have yet to hear back from the redoubtable Mr. Smee, but we hasten to point out that his Twitter feed conspicuously features the New York Times review of his book, The Art of Rivalry. Not Michael Upchurch’s Boston Globe review. Is Sebastian Smee Jumping to the New York Times? 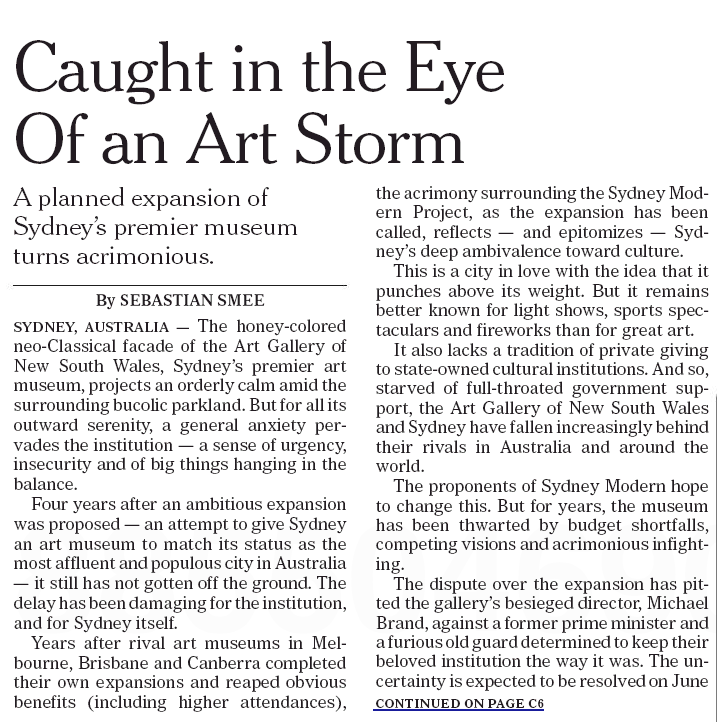 As the hardreading staff perused our costly print version of the New York Times yesterday, we came across this piece on Page One of the Arts section. 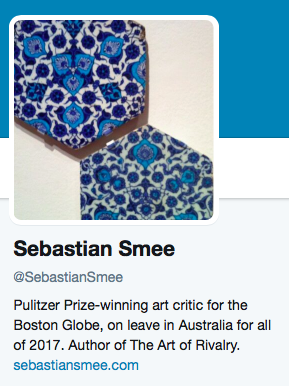 Wait – is that the byline of the Hub’s own Sebastian Smee, Boston Globe Pulitzer Prize-winning art critic? Which got us to wondering: 1) where in the world is Sebastian Smee, given that his last byline in the Globe was back in December; and 2) has he abandoned Boston for the Big Town. Smee’s Twitter profile seems to answer both questions. Regardless, we’ve tweeted the redoubtable Mr. Smee to ask if he has permanently fallen under the spell of the Good Grey Lady.